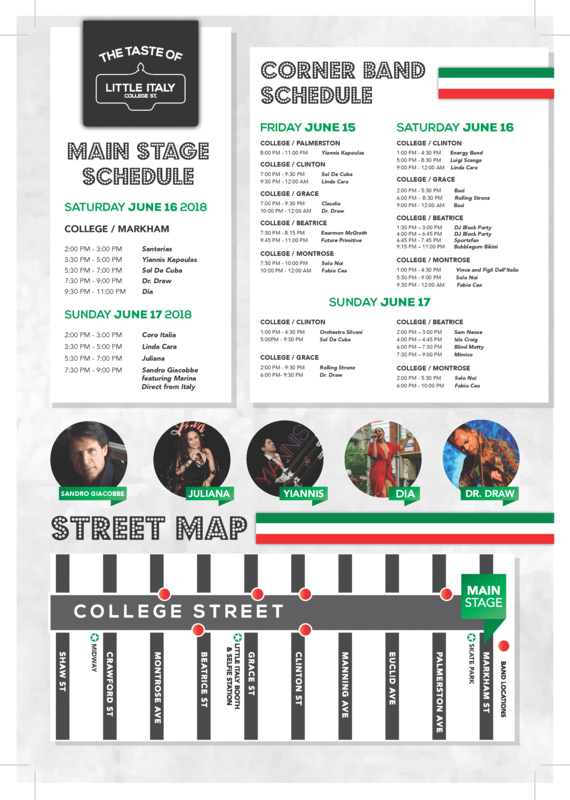 The Taste Of Little Italy 2018 - Little Italy College St.
From June 15th — June 17th College Street, from Bathurst St. to Shaw St., will close to vehicle traffic as we welcome thousands of pedestrians to our annual Taste of Little Italy street festival. Friday, June 15 – 7:00 p.m. – 1:00 a.m.
Saturday, June 16 – 11:00 a.m. – 1:00 a.m.
Sunday, June 17 – 11:00 a.m. – 10:00 p.m. Enjoy live music on multiple street corners and on the main stage, extended patios, multicultural vendors, amazing food, carnival rides and new this year a learn-to-skate park where children can learn how to scooter and skateboard safely. From restaurants and street vendors, to the myriad of free tastings and samples, you won’t leave unsatisfied. Just make sure to come on an empty stomach — it’s the only way you can properly enjoy all the classics — like authentic Italian pasta, wood-fired pizza, and tradition and non-traditional flavours of gelato. If you’re looking for something a bit different, you won’t be disappointed, as the festival is known for it’s diverse and multicultural food options. Kick off the World Cup on College St. and enjoy the Taste of Little Italy, and a lot more! Mastro San Daniele and TD Canada Trust. Yes! I want to receive electronic communications related to the Little Italy BIA. You can unsubscribe at any time by updating your profile.